Settled at a height up to 2050m, Darjeeling is listed among the most popular honeymoon destinations in India. The marvelous hill station attracts thousands of visitors from all parts of India and across the globe. Referred to as the ‘queen of hills’, the exotic location has a number of attractions and tourist spots. The prime highlights of the place are Darjeeling Himalayan Railway- a UNESCO World Heritage Site and several tea estates. The hill station has all what a traveler requires for a perfect holiday. Later, Check-in at a pre-booked hotel and settle down. In the evening either you can loosen up or go out for shopping. Some of the unique buys of Darjeeling are amazing kitchen wares, variety of teas, brass statue, woven fabrics and shimmering accessories. Get back to the hotel room, have breakfast and relax. Again get ready for local sightseeing in Darjeeling. We take you to some of the important places of interest in Darjeeling including Padmaja Naidu Zoological Park, Himalayan Mountaineering Institute (closed on Thursday), Passenger Rope way, Tenzing and Gumbo Rock, Tibetan Refugee Self Help Center, Tea Estate, Natural history museum (Sunday closed) and Peace Pagoda. One of the finest ways to adore the beautiful Darjeeling is by Passenger Rope way; India’s first passenger rope way. Enjoy scenic views of mountains in Sikkim, River Rangeet and well-maintained green farms; Bengal Natural History Museum- exhibits a rich display of flora and fauna; Peace Pagoda- one of the most important places in Darjeeling that deserves your visit is Peace Pagoda. It was put up by Nichidatsu Fujii, as a symbol of world peace, to unite people of all caste and religion. The structure of the building symbolizes simplicity and sanctity. You c an also enjoy the location as a great picnic spot. Not to forget the wonderful markets which are full with Tibetan jewelries, artifacts, copper wares, handicrafts, masks and items made from bone. the day is set out to explore Kalimpong. Take your morning breakfast and proceed through scenic road to Forest museum (closed on Thursday), Deolo Hill, Hanuman Mandir, Dr. Graham Homes (school), Durpin Monastery, Mangaldham and Pine view nursery. 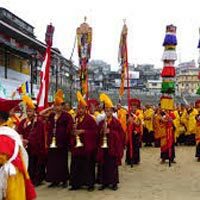 On day of your Darjeeling - Kalimpong - Pelling - Gangtok tour, check out from the hotel and travel to Pelling via Jorethang (a town in South Sikkim). On the day, done with your morning breakfast, check-out from the hotel and straight away travel to Gangtok. Popular for its iconic monasteries, educational institutions, striking valleys and wonderful sanctuaries, Gangtok is the most traveled destinations in North East of India. The place has much to offer when it comes to attractions. 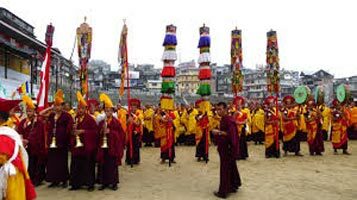 In fact, the place has so many monasteries that it has been also famed as the ‘land of monasteries’. Counted among the main places to shop in the state of Sikkim is Directorate of Handicrafts and Handloom Emporium. The center provides you several articles falling under your budget. Some of the items you may go for are Tibetan carpets, excellent handicrafts including Thankas, Choksee and locally made furniture.